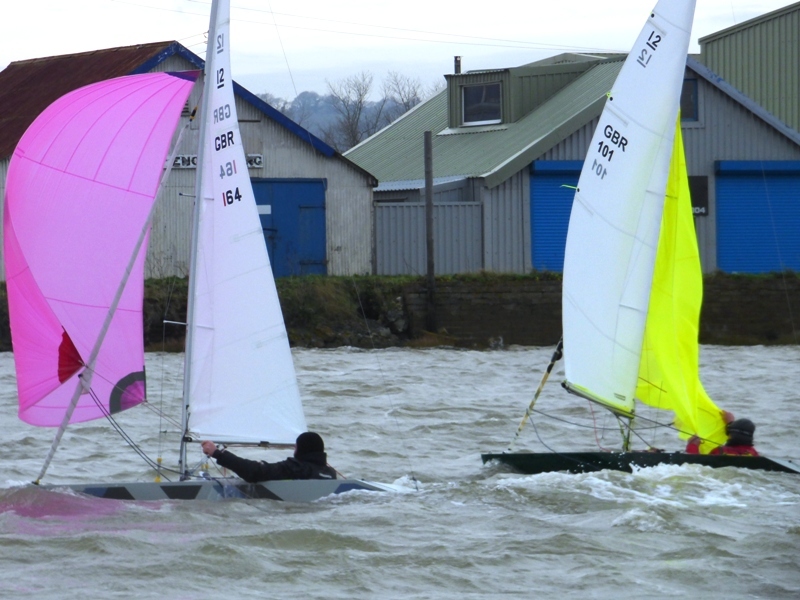 Well no ice this weekend, but the NNE’erly F4/F5 breeze on Saturday and the Easterly F7 on Sunday made it pretty cold and obviously ruled out racing anywhere other than in the harbour for those that braved it. 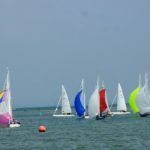 After a rather cautious start to the first race on Saturday, it came as no surprise to see Mark Downer’s pink spinnaker leading the fleet down to the leeward gate for the first run closely pursued by Bruce Huber’s lime green one. Unluckily for Alastair Speare-Cole his genoa pin came undone just before the start but full marks for making Selwyn Pontoon before his rig collapsed. In the second & third rounds, Mark extended his lead slightly over Bruce and the chasing fleet led by Justin Biddle and Steve Warren-Smith who had a great battle with Justin just managing to hold onto third place. Lower down the fleet, Bill Daniels and David Peerless were also neck and neck. The start of the second race was much closer; Steve W-S was the only one OCS, albeit as he was at the pin end it did not take him long to get going again. Meanwhile Mark Downer who was mid-line decided to play it safe so also came back. This put Bruce out in front and although it was not long before Mark had made his way up to second place, the final result was never in any doubt. David Peerless was a very creditable third, and Bill Daniels fourth. 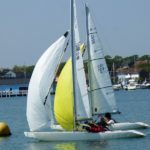 The third race was delayed a little to allow Justin Biddle to make the start after he had had to sail back to the Club pontoons for repairs to his kicker that had parted company. 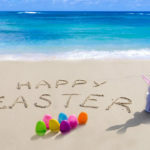 With the breeze gusting 18 knots, the start was another good one with no one OCS. True to form the first two round the windward marks were Bruce and Mark who then proceeded to match race for the rest of the race! There was very little in it until they were nearly on the layline to the windward mark for the final round when Bruce had to take a penalty having been caught out on port. Bill Daniels was third and Alastair S-C was fourth. 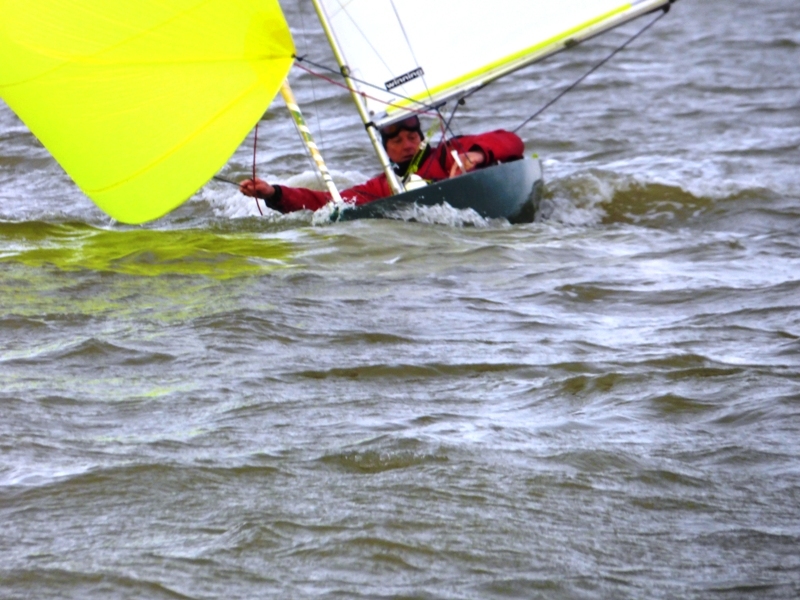 As the forecast for Sunday was looking pretty windy, it was decided to have a fourth race just to be on the safe side. 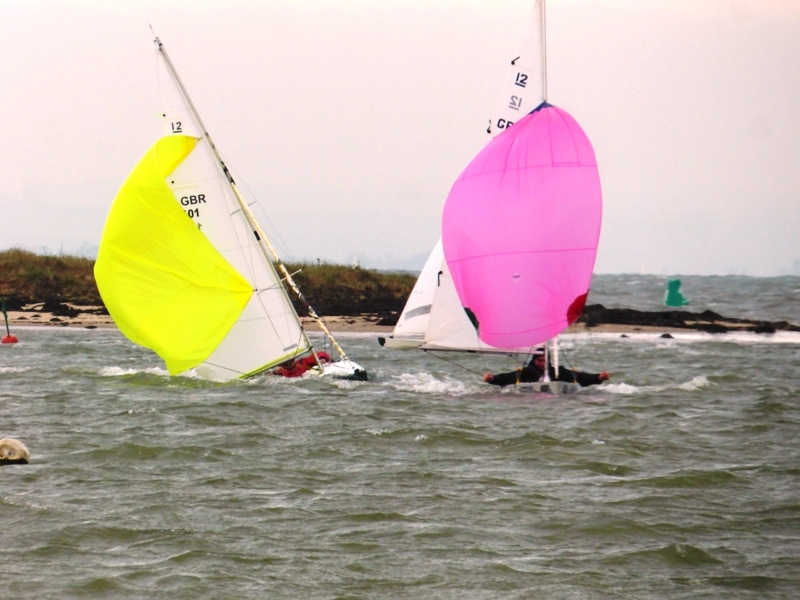 Still gusting 18 knots, the start was another show piece example of just how competitive the Illusion racing is. Mark lead the way from the start with Bruce ever hopeful that he could magic an advantageous wind shift but to no avail and he had to make do with his third second place of the day. In the knowledge that everyone was pretty cold, the race officers sensibly finished the race at the windward mark after two and a half rounds which made it a nice short reach back to the Illusion Quay once they had finished. Steve W-S had a good race and was third and Bill D was fourth. 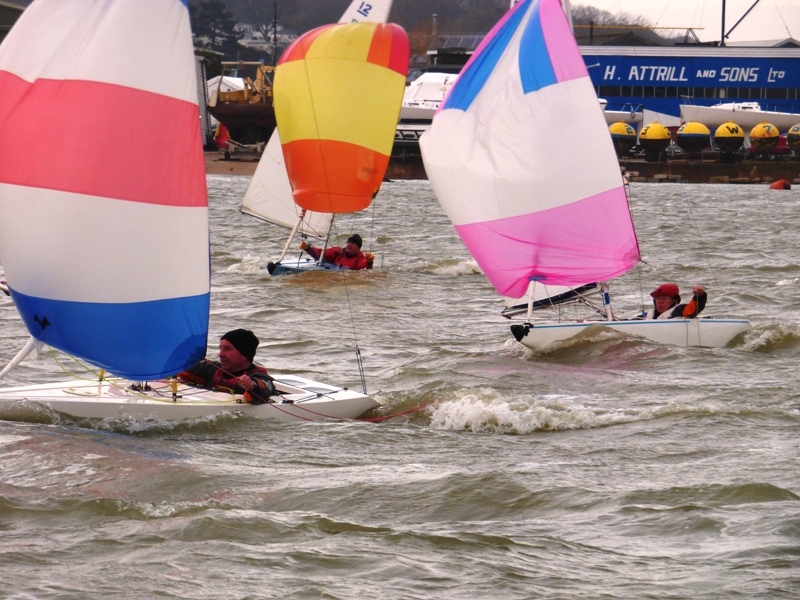 Family commitments and the breezy forecast reduced the fleet to seven on Sunday. Indeed had there been fewer turn up then we would probably not have ventured out. However after considerable discussion waiting for the tide to make, it was decided to give it a go. With it blowing from the East, the windward mark and the spreader were tucked up in the shelter of the dunes with the Committee Boat anchored mid-harbour. 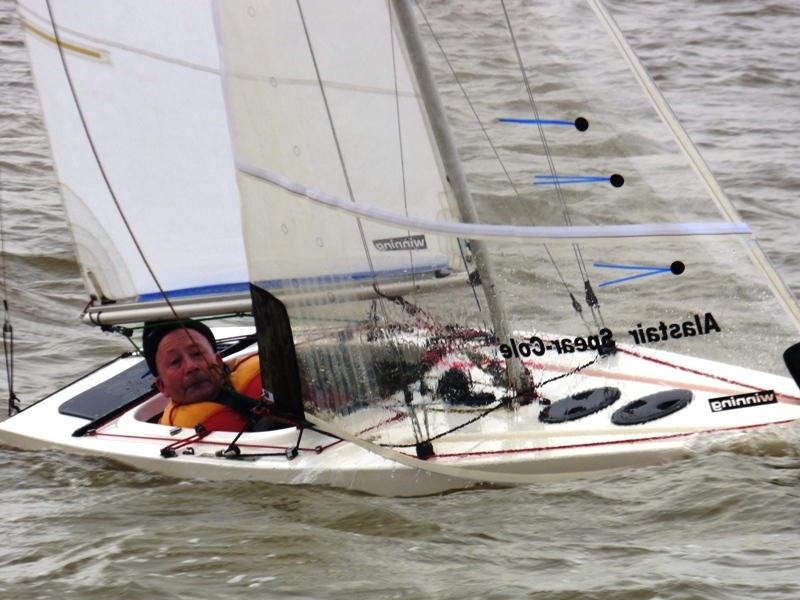 Having come all the way from Salisbury to sail, David Peerless unfortunately missed the start when, having launched he found his steering was not working. This left six boats to make a go of it in the “survival conditions” as the breeze increased. Not unsurprisingly Mark Downer was the first to reach the windward marks and even he decided to stick with his genoa for the run to the leeward mark that had been re-located further up the track in slightly less turbulent water. Robin Ebsworth was second and Bill Daniels was third. Despite best efforts to reposition the Committee Boat in slightly more manageable conditions this proved to be too difficult to achieve so with only Mark and Robin still sailing (Alastair S-C & Mike Toogood filled up but after a bit of help got back to the Illusion Quay safely, and Bill Daniels & Olly Laughton-Scott were able to get back under their own steam) the race was terminated and further racing was abandoned. An interesting afternoon! 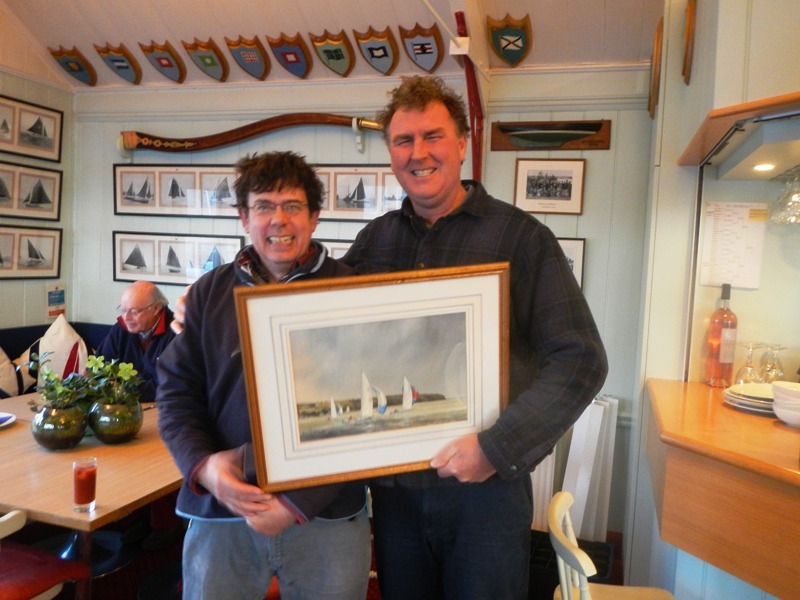 Congratulations to Mark who was the clear winner of the Icebreaker Trophy; Bruce Huber, despite not being able to sail on both days, was second and Bill Daniels was third. 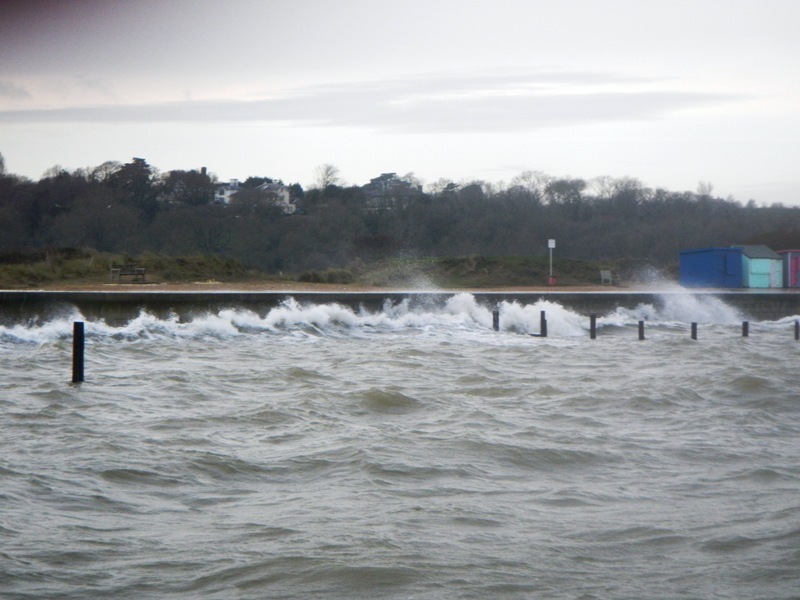 No sailing next weekend; the next Regatta, for the January Jacket, is on 20th & 21st January (10:30 & 11:00 starts respectively). Unfortunately, no photos from Sunday – Mike was too busy in the RIB.